A Supermoon is a special occurrence that basically means the moon is much closer to the Earth than it usually is. 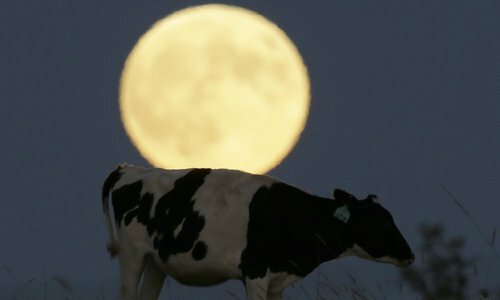 Why does a Supermoon happen? The magical event happens because of the unusual egg-shaped orbit of the moon. One part of the moon's journey around the sun is is much closer (around 30,000 miles) to the earth and the rest of it. What will this the Supermoon look like? Because of it's unusually close proximity to the Earth, the moon will appear up to 14% bigger and 30% brighter than your typical full moon does. The incredible spectacle means the moon will look bigger than it has done at any point for the whole of the 21st century. When will the Supermoon appear? The date when the the Supermoon will be at its most brightest is November the 14th - so get that in your diaries NOW! Where can I best see the Supermoon? The moon will appear at its biggest when it is low-hanging and near the horizon. For that reason, it's best to get yourself up somewhere high up like a hill. If I miss the Supermoon, when can I see the next one? Unfortunately if you miss the event, it isn't good news. The next one won't be along for another 18 years! So make sure you're out and about on the evening of November 14th. The moon hasn't been this close to the earth since 1948 and won't be again until 2034 - so for many people this will probably be the most amazing the moon will ever look during your lifetime. However, there will be three other smaller Supermoons before 2016 is out, so don't worry too much!